Apple is to offer its all new features from iOS 6, including a massive maps application, onto a load of existing devices. The new iOS platform is fairly wide-ranging in its compatibility, as it only eschews the original iPad and surprisingly keeps going with the iPhone 3GS. 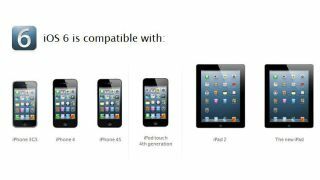 The full range of supported devices are: iPhone 3GS, iPhone 4, iPhone 4S, iPad 2, new iPad and all iPod touch devices from the fourth generation onwards. The new update is pretty wide-ranging, bringing a wealth of new features to encourage users to update to the next-gen platform. iOS 6 Maps is the big new release, which Apple has created from the ground up - bringing 3D modelling that apes Google Earth, and like Google's Maps app offers turn-by-turn navigation with Siri integration. You're also getting an all-new mailbox set up, Facebook integration, more power to Siri (if you're on the new iPad 3 or the iPhone 4S) and the ability to share Photostreams. The iOS 6 release date has been set for autumn, which we're expecting will be around September - can you say iPhone 5 launch, anyone?